This was inspired by a dessert we had at a dessert bar in NYC, But I'll tell you more about that in my next post. I saw Condensed milk ice cream on their menu and knew I had to have it. We ordered it and it didn't disappoint! The texture was smooth and creamy with a great velvety mouth feel. The flavor veers towards the sweet side of things but it still really gives you a great sweet cream flavor. And you can taste the milk, which is something I love. So onto the recipe! Three ingredients: Heavy cream, Vanilla bean paste and one can of condensed milk. You can use vanilla extract if you can't find vanilla bean paste, but I highly recommend the paste. 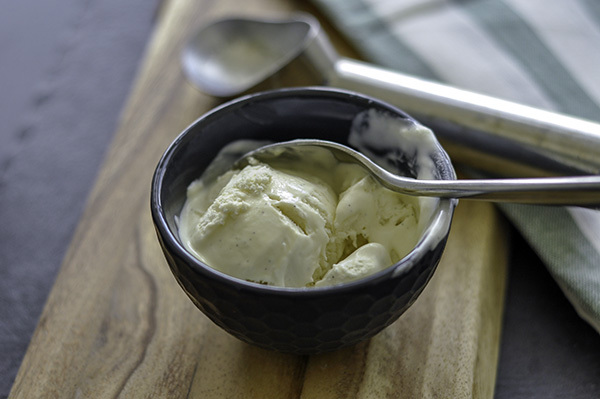 The paste contains the vanilla bean seeds, so not only does it give a really great, strong vanilla flavor, you can see the specks in your ice cream, which adds to it's visual allure. I usually buy mine at the William Sonoma outlet or you can find it at Sur La Table or even Amazon. Begin with a cup of cold heavy cream in a large bowl of a stand mixer fitted with the whisk attachment. Whip this up till it thickens. Then add in your vanilla and continue whipping till you reach soft peaks. Stop the mixer and add in the condensed milk. It's super thick and sticky so I do recomend turning off the mixer before adding it, otherwise it will turn into a sugary mess. Trust me... and learn from my mistakes! Then turn the mixer back on and whip till you get somewhat stiff peaks. About 3-5 minutes. Then pour this mixture into a freezable container. I used this one from amazon. Now freeze for a minimum of 4 hours. I froze mine overnight. The mixture turns into a smooth creamy frozen treat. Scoop and try not to eat the whole tub in one sitting! Oh My Gosh, it is ridiculously good! I honestly can't get enough! Try it please!! And let me know what you think! My next post will be about my favorite way to eat this ice cream, and it's not in a bowl! Stay tuned and follow me on instagram for more recipes and pics from my eatings around town! In the bowl of a electric mixer fitted with a whisk attacment, pour in the heavy cream and whip till thickened. Add in the vanilla bean paste and continue whipping till you reach soft peaks. Stop the mixer and pour in the can of condensed milk. Whip until you reach a slightly stiff peak, approx 3-5 minutes. Pour this mixture into an ice cream container of a freezable food storage container and freeze for a minimum of 4 hours to overnight.